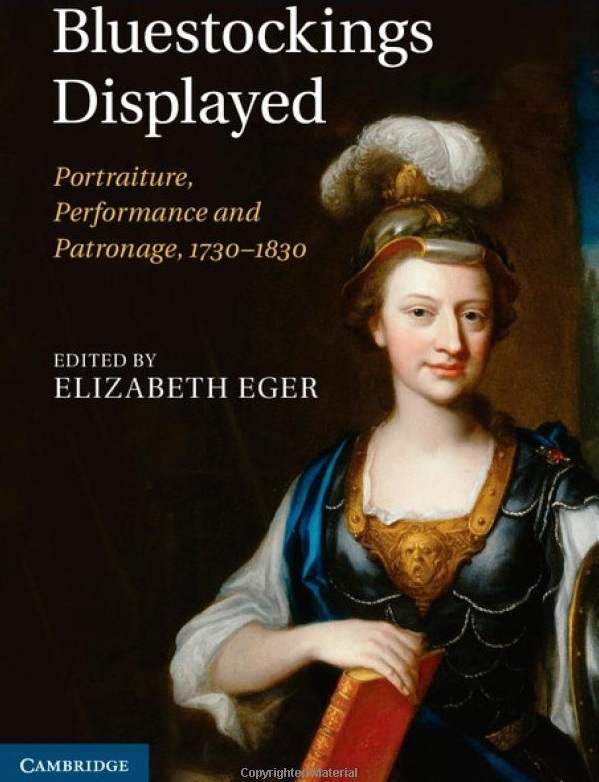 'Bluestockings Displayed: Portraiture, Performance and Patronage, 1730-1830' edited by Elizabeth Eger, (Cambridge: Cambridge University Press, 2013) ISBN 978-0-521-76880-1 pp. i-xv; 309. The excellent Brilliant Women exhibition at the National Portrait Gallery in 2008 and the associated conference, where the majority of the essays within this book were first presented, tried to challenge the traditional dour image of bluestocking women. Instead they highlighted the vitality of the women, their ideas, and their associated visual and material cultures. Throughout this book the focus is on the representations of bluestocking women, through their portraiture, the satires associated with them, and their own writings. Bringing together a range of leading historians, art historians and literary scholars it is an interesting and engaging book which successfully challenges the narrow stereotypes associated with eighteenth-century learned women. It is separated into three parts, each with different strengths. The first section focuses on the portraits associated with bluestocking women, which looks at the work of a range of artists including Thomas Lawrence and Henry Fuseli. Anne Mellor’s opening essay expertly maps the shifting visual and literary representations of intellectual women during the late eighteenth and early nineteenth centuries from classical muses, to odious creatures, and then domestic matrons. This essay successfully underpins the rest of the book, reflecting the uneasy balance between virtue and intellect that bluestocking women wanted to challenge. Two of the essays in the second section, which focuses on performance, explore this uneasiness in relation to a much understudied topic: the response of intellectual women to music. Susan Staves highlights the conundrum that bluestockings faced when considering the status of female sopranos. While they wished to champion women’s ability to master all of the sciences and arts, engaging in operatic singing ran counter to the argument that women were capable of rationality due to its association with sensuality. Staves’ interesting essay considers the different ways that intellectual women, and the singers themselves, responded to this disconnect. Similar themes appear in Joseph Roach’s essay on Eliza Linley, which explores her status as ‘sacred icon of her secular society’ (p. 125), her representations and the challenges faced by artists who wished to portray her extraordinary singing voice. The final section, which focuses on patronage and networks, explores the interconnections and wider roles of the bluestockings. For example, Clarissa Campbell Orr examines the political career of Elizabeth Montagu. She argues convincingly that she became a salonnière due to a patriotic agenda combined with the absence of a role for her in Court or in Westminster circles in light of her husband’s political independence: her husband did not create political networks for her, so she found and developed her own. Markman Ellis also looks at Montagu, mapping her epistolary networks and highlighting the way in which Mauss’ work on gift exchange can be used to understand the status of letters between bluestockings. In the insightful introduction by Elizabeth Eger, the book’s editor, the interdisciplinary nature of the book is highlighted, and this indeed is one of its strengths: it is not just a collection of essays from scholars across a range of academic backgrounds, but these writers directly engage with ideas, sources and approaches from a number of disciplines in their essays. This is one of the great strengths of current research in eighteenth-century studies and it is great to see it within this volume. It is therefore a little disappointing that, despite it being highlighted in the introduction, there is relatively little engagement with objects other than those that can be described as examples of artistic and/or visual culture. For example, a couple of the essays could have more fully examined books as objects, and an object-centred essay may have given the collection an extra dimension. That being said, the discussion of the visual sources is very strong, and the essay by Devoney Looser on portraits of older women is especially engaging. This essay considers the ways in which older women represented themselves in their writings, their portraits, and their frontispieces, and how it was difficult for them to convince the public that, as learned women, they aged well. There is also close reading of specific portraits in both E. J. Clery’s and Clare Barlow’s excellent essays that consider the different ways that female intellect was portrayed. As this is a very visual book it is great to see so many images, and so it is unfortunate that there are no colour plates. This, though, is one of the realities of academic publishing today, where costs need to be carefully considered. The format of this book, a series of different essays, is this volume’s greater strength as well as being at the heart of some of its weaknesses. A number of the essays make similar points, with the story of the origin of the term ‘bluestocking’ being retold a number of times, and Samuel’s Nine Living Muses (below) is referred to by a several authors. There is also no clear consensus as to which women should be identified as members of the bluestocking group. However, this is something that the essays directly discuss, including Shearer West’s piece that argues that Sarah Siddons can be seen as an honorary bluestocking, despite being an actress. Because it has been produced by a number of authors it is possible for the book to take different approaches and look at the experiences a range of women. This includes an examination of the learned status of Hester Thrale by Felicity A. Nussbaum, Harriet Guest’s work on the satirical attacks on ‘fashionable’ women, and a discussion by Alison Yarrington of the struggle faced by sculptor Anne Seymour Damer for her work to be taken seriously by her contemporaries. The variety of approaches, different focuses, and range of arguments presented by the essayists all contribute to an engaging volume that adds to our understanding of these ‘brilliant’ women; it means that the bluestockings’ lives, knowledge and experiences are put on display and allowed to shine.